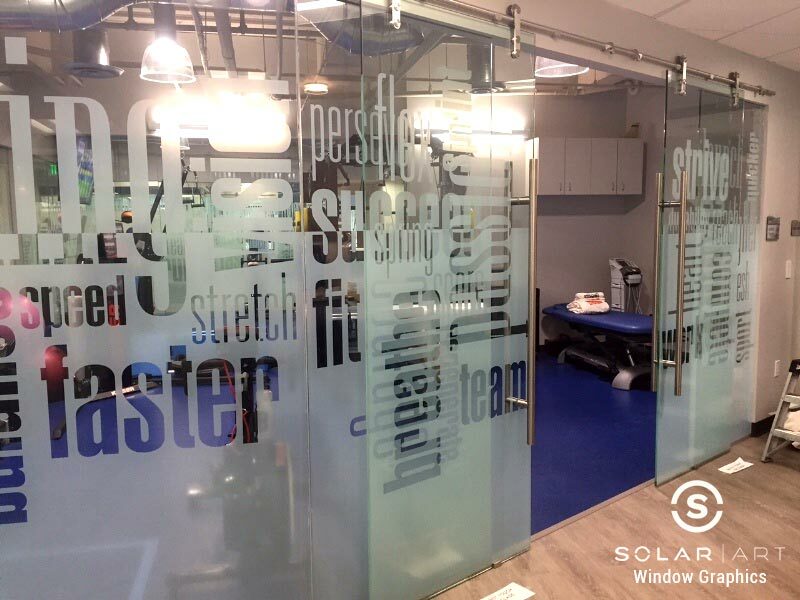 Solar Art installed this really cool window graphic to a fitness room in San Diego, California! The customer wanted a custom printed graphic, but wasn’t exactly sure what they were looking for. They knew they wanted motivational quotes to inspire and motivate current and potential customers.They also knew they wanted a unique design piece and wanted privacy as well. Since they weren’t sure what they were looking for exactly, they worked with our in house graphics team to produce the perfect graphic for this space. Our graphics team was able to collaborate with the customer to come up with the motivational quotes and created proofs of what the finished product would look like for the customer to approve. If you aren’t sure of what you want, don’t worry, we can walk you through it step by step! Window graphics give you the flexibility to create your own design perfect for your space. They are easily removable and can be replaced with a different design. Custom graphics can be applied to both windows and walls. Wall graphics can also easily be removed and replaced. They work great in both residential and commercial settings. This particular graphic was printed and cut on a frosted window film but with custom graphics you have the freedom to decide the material you want to use. You could use a more opaque window film to create more privacy or even a shimmered window film to create more fancy design piece. You can also have a wall mural of your favorite travel destination or movie scene installed to enjoy for years to come! Solar Art has installed window graphics to private offices, conference rooms and even home offices! Graphics are installed the same way as solar film, anti graffiti film, security window film and decorative window film! Wall graphics can reduce heat and reduce glare as well as reduce 99% UVA and UVB rays! Contact us directly to talk about window graphics! Window graphics provide privacy and a custom design for your home or office. You can work with our in house graphics team to get exactly what you are looking for. Contact Solar Art to learn more!